In this February 18, 2018, file photo, people look on at the Marjory Stoneman Douglas High School in Parkland, Florida. Police arrested 19 year old former student Nikolas Cruz for the mass shooting that killed 17 people on February 14. A retired Secret Service agent pointed out security vulnerabilities at a Florida high school two months before a gunman killed 17 people there. 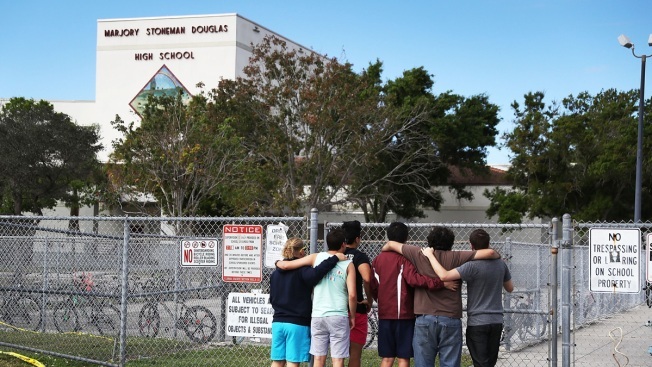 The Sun Sentinel of South Florida reports that retired agent Steve Wexler pointed out unlocked gates, unlocked doors and no identification badges for students at Marjory Stoneman Douglas High School. Wexler's children had graduated from the high school and he spoke regularly to classes about law enforcement. He had previously offered to make security recommendations, and he was asked to conduct a "site survey" of the campus last December. Accompanied by an assistant principal, Wexler walked through the school with Post-it notes numbered 1 through 20. He handed them out to staffers or stuck them to desks and doorknobs to point out their vulnerabilities.